Marjory Stoneman Douglas High School student David Hogg, left, walks to class for the first time since a former student opened fire there with an assault weapon, Wednesday, Feb. 28, 2018, in Parkland. If the call to boycott travel to Florida over gun control has any impact, this tweet is where it began. Stoneman Douglas High Senior David Hogg is one the student leaders who have emerged out of the mass shooting tragedy to demand new gun control measures in Florida. He has called out companies that have relationships with the National Rifle Association (NRA) and called for a travel boycott of Florida. That last effort takes the gun debate right to one of the state’s most important industries. It is among the strategies recognizing the force of finance. Governor Rick Scott had been scheduled to come to Juno Beach on February 15 and release the latest Florida tourism data. Last year was probably another record year for the state. Through September, visits were up more than three percent, putting the year on pace to have the state host more than 112 million visitors. But the day before the governor was set to announce the statistics a gunman brought an AR-15 to Stoneman Douglas High School in Parkland, opened fire and killed 17 people -- making it the worst mass high school shooting in America. The governor's office says the 2017 tourist data will be released soon, but there is no date scheduled. 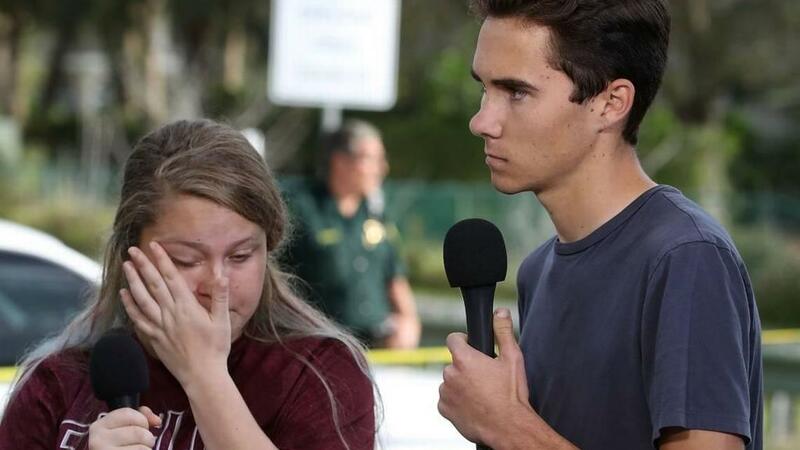 David Hogg, left, is a senior at Stoneman Douglas High School. He has used his growing social media presence to call for a travel boycott of Florida over gun control. Hogg and other student activist leaders from Stoneman Douglas have challenged entrenched public policy positions with deep-pocketed and well- connected supporters -- notably the NRA. They have turned the Florida Legislative session on a dime to focus on guns, mental health and school safety -- issues that barely registered if at all on the political agenda before the February 14 massacre. Now they dominate the discussion with one week left in the regular session in Tallahassee. And with his travel boycott call, Hogg aims to use the state’s biggest industry as leverage. "What I hope this boycott accomplished," he said, "is just reasonable gun legislation that makes sense on both sides of the aisle." About one out of every six jobs in Florida is related to the tourism industry. Hotels, cruise lines, air travel, amusement parks -- all rely on out of state visitors. And Hogg realizes his boycott effort, while symbolic, also could cause financial pain for working Floridians. "To the people who depend on the tourist economy in Florida I say, 'I'm sorry.' These politicians can take simple actions to ensure that your business and your job survives." Representatives from the tourist industry did not want to talk publicly with WLRN about the boycott effort. The state’s tourism marketing agency, Visit Florida, said in a statement it continues to market the state "as a welcoming and safe world-class destination. The Sunshine State is always open for business." Florida teachers and school staff members have a pension fund totaling $160 billion. About $1 out of every $100,000 is invested in one of four gun and ammunition makers the pension fund holds in its portfolio. Given the size of the overall pension plan, it isn't a lot of money. It is money invested in the stock of American Outdoor Brands. It used to be called Smith and Wesson. The plan also holds financial positions in Sturm Ruger and Vista Outdoor. Vista is the company behind Camelbak water packs, Bell bicycle helmets and Bushnell binoculars. It also makes guns and ammunition. Vista stock fell 61 percent last year. American Outdoor stock dropped 39 percent. Ruger gained six percent. The Florida Retirement System Pension Plan totaled $160 billion at the end of 2017. It held investments in the stocks of three gunmakers totaling $1.7 million. But stock price performance is not why the Florida Education Association wrote a letter to Governor Rick Scott after the Stoneman Douglas shooting. FEA President Joanne McCall said they wrote the letter to hope there are "other places" for the teachers pension money. Even though the money is invested for teachers and school staff in retirement, like most pension plans, they have no say over how the money is invested. The FEA has not requested the plan sell its gun stocks, but if it did, two of the three would have been profitable investments. According to the plan's portfolio, as of the end of last year, the combined investment in all three was up $216-thousand dollars indicating at least some of the positions are long-term investments. It’s been just over two weeks since the shooting that left 17 people dead at Marjory Stoneman Douglas High School in Parkland. But on Friday afternoon, a handful of Cypress Bay high schoolers came to Weston Regional Park wearing maroon ribbons to show support for Douglas students...and to get registered to vote. Veronica Carbonell, a 17-year-old senior at Cypress Bay, was one of the students who registered at the event. The first Broward Sheriff's deputies who arrived at Stoneman Douglas High School on Feb. 14 were told not to confront the gunman. According to a dispatch log reviewed by the Miami Herald, the sheriff’s captain who was first in charge of the scene told officers to set up around the building. The Broward Sheriff's Office neither confirmed nor denied that the order was given. Mike Fernandez has raised millions of dollars for mostly Republican politicians, but he says no one seeking public office will get his money if they don't support gun control.